BOARDROOM BIM – Is Building Information Modeling Relevant to C-level Executives? 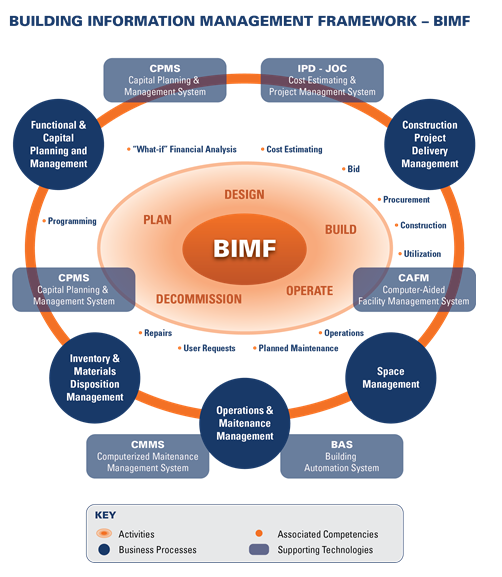 Efficient life-cycle management of the built environment (BIM) is critical to many/most members of senior management, if just that they don’t know it. The success or failure of many organizations is directly linked to the built environment for the majority of public and private organizations. From a financial perspective, facilities and infrastructure are second only to personnel in terms of bottom line costs. Whether in manufacturing, DOD, healthcare, education, banking/finance… or almost any sector… facilities are directly linked to the organizational mission and impact the ability of an organization to perform that mission. Lastly, and not least important, environmental impacts of the built environment are significant, consuming 30%+ of total non-renewable energy and contributing to 30%+ of greenhouse gas emissions. So, why has the “BOARDROOM” virtually ignored the efficient management of the built environment? Simple, facility management executives have not presented key information to senior managers in language the latter understands – impacts to the bottom line, mitigating risk, remaining competitive, retaining key personnel, in short, the built environment’s linkage to organizational mission. Furthermore, many/most facility managers do not fully understand/appreciate the context and/or requirements and processes associated with efficient life-cycle facility management / BIM. And for that matter, nor do many so called IWMS software vendors (Integrated Workplace Management System). Many individuals associate BIM with 3D modeling and construction, vs. “true BIM”, the total cost of ownership management of the built environment. Climate change is real, no debate left… period. If for no other reason than to mitigate human impacts upon climate change, efficient facility life-cycle management should be a REQUIREMENT at the boardroom level. Of course, mere long term survival of the human race as we know it may not be a concern of some c-level folks focused exclusively on quarterly profits. So, for those individuals, FMers need to help the c-level gain visibility into the bottom line costs currently expended upon operating physical infrastructure and the associated direct and indirect impacts the condition of the built environment has upon product/services quality, dollars wasted upon unscheduled/emergency maintenance/repair vs. preventive/schedule maintenance/repair and renovation, risk mitigation, etc. etc. BIM is a strategic, boardroom-level resource if applied properly. What is your organization to plan for the future of collaborative, efficient facility life-cycle management? http://www.4Clicks.com – Premier software for construction cost estimating and efficient project delivery – JOC – Job Order Contracting – SABER – SATOC – IDIQ – MACC – POCA – BOA – MATOC ….